In January, I presented to you the individual members of Circle of Fountains, complete with pictures and small bios. This post broke down the four types of membership within the group: Primary Members, Guest Members, Associates and Novices. Primary Members are the core of the group. These members share the responsibility of sabbat rituals, teaching novices, maintaining the formation of the group and, in exchange for equal say, contribute some sort of responsibility to the group. This is their role. Some of you asked me about what those roles were, so here they are! This is my position within the circle. Though we try our best to come together as a circle of equals, the Circle Coordinator position is likely the leadership position within the group. The Coordinator creates and manages the group events including sabbats, esbats, meetups and more, maintains the group customs and regulations, documents each ritual with photos and notes and, in decisions and emergencies, has the final word. During meetings, the Coordinator directs discussion by maintain focus, bringing up topics of interest or concern and ensuring all members have a chance to speak. The Coordinator also maps out a lesson plan for the Novices based on their personal interests and needs so that the rest of the Primaries have direction in their teaching. The Archivist upkeeps the group BOS by obtaining copies of rituals from the ritual leaders. It is the Archivist’s job to maintain a physical and digital copy in case of physical copy damage or loss. The Archivist has been separating our BOS by year, so we have one for 2014, one for 2015 and one started for 2016. She’s also been making it incredibly gorgeous, so kudos! The Auditor manages Circle inventory. While we have no real shared inventory - items that the circle has bought together as a whole - all of our members have items they’re happy to share for ritual, including but not limited to: Books, candles, altar items, garlands, decor, etc. This also includes skill sharing, such as wood burning, paper crafting or sewing. It is the Auditor’s job to record these items, denote who owns these items, keep track of who lent what to whom, and notify the circle when items are low if they’re of frequent use. The idea behind this position is to minimize the cost of planning sabbats and esbats so that individual members don't have to spend on items other circlemates may have. The Nutritionist coordinates potlucks for sabbats by starting a discussion thread and ensuring all members who RSVP yes sign up for a dish. It’s the Nutritionist’s job to ensure we have a main course, sides and desserts in a way that the meal is balanced. It is also the Nutritionist’s responsibility to ensure all dietary restrictions and allergies are covered. For example, we have multiple Celiac members, so we have half of the circle assigned gluten-free dishes. The Nutritionist must remind members of who is bringing GF dishes and ensure that they are indeed GF. We have a member who is very allergic to peanuts, so no dish can contain peanuts. So on and so forth. The Record Keeper maintains records on all of the circle members, including phone numbers, addresses, birthdays, allergies, medical insurance information, preferred hospitals, emergency contacts and more. It is the Record Keeper’s responsibility to keep these records up to date in case of emergencies. In fact, we had an emergency over the weekend where I needed phone numbers and the Record Keeper’s records came in handy for that. The Stenographer takes notes at all circle meetings. We have one meeting every two months to discuss important items of note, and two meetings a year to receive applications for potential new members. During our last Drunk Divination, before the alcohol kicked in, we had a meeting about the lesson plans for the Novices. Abby even has a specialized, gorgeous, leather-bound book for this passed to her by Kira. The Publicist’s job is to oversee the circle’s social media presence. While all members have access to our social media pages (ie Facebook), the Publicist ensures no post is too personal or inappropriate for our public image and upkeeps our social media pages by posting occasionally themselves. The Publicist also creates new pages on social media as the need arises. It is the Advocate’s responsibility to seek out community projects and volunteer opportunities for the circle. This includes ensuring CF has a presence at community events and that the circle stays up-to-date in the community. The Advocate also organizes circle participation in community events as needed, such as the Pagan Garage Sale or any public rituals or teaching opportunities where we have been asked to present. 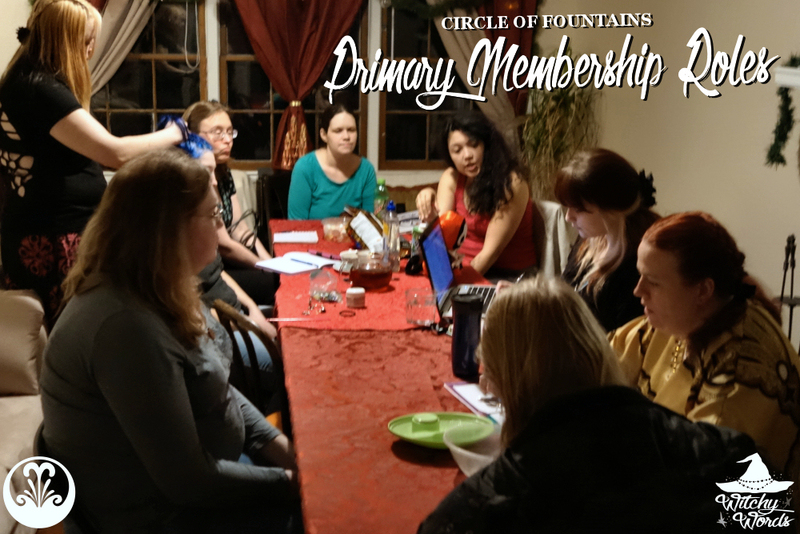 Membership roles are so incredibly vital to how Circle of Fountains functions. With Primary Members sharing the needs of the group, each circlemate feels less burdened by the immense responsibility it is to maintain the circle as a whole while still maintaining the group's functionality. I appreciate everything each and every one of these amazing people do to help Circle of Fountains be the circle it is today! You guys all sound awesome! Maybe I'll have a circle some day....still learning for now though. I'm glad it's all come together so well for you! Do you ever accept online members? Unfortunately, I left CF in June of this year.